FamilySearch.org now provides access to the Brigham Young Family History Archive, a large collection of scanned genealogical books. On the Catalog Search Screen. To search the entire collection, click Library Catalog on the search screen. Then click Brigham Young University Family History Archive. Fig. 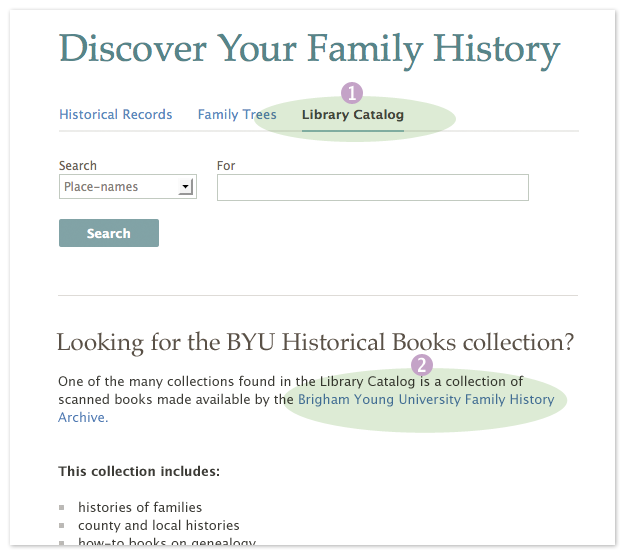 1: Screenshot of clicking the Library Catalog tab on the FamilySearch Search Page, then clicking on the link to the BYU Historical Books collection link below. In the Catalog. If a book or periodical in the Family History Library’s collection has been scanned, the Library Catalog provides a link directly to it. Fig. 2: Screenshot highlighting the link to click to view scanned publications online. The books come from the collections of the FamilySearch Family History Library, the Allen County Public Library, the Houston Public Library – Clayton Library Center for Genealogical Research, the Mid-Continent Public Library – Midwest Genealogy Center, the BYU Harold B. Lee Library, the BYU Hawaii Joseph F. Smith Library, and The Church of Jesus Christ of Latter-day Saints Church History Library. Search the Google Books collection at books.google.com. Another library or archive might have the item that you want. Search the catalogs of thousands of libraries worldwide on WorldCat at www.worldcat.org. Even if your local library does not have a copy of the item that you want, your library might be able to order it through an interlibrary loan program. You might be able to purchase the item through a bookseller or online auction. 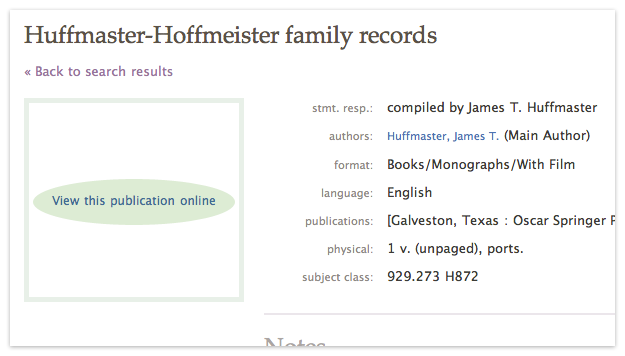 Use the title, author, and publication information from the catalog to make sure that you get the correct item. Another great library source is the Internet Library Digital Archive at archive.org. They have books that are out of copyright available to download for free. Searching the site is more like a library – by title (or part of), subject, etc. – not like GoogleBooks which searchs within the book for keywords. I have found a ton of great books on the Internet Library that have proved very useful in my research.